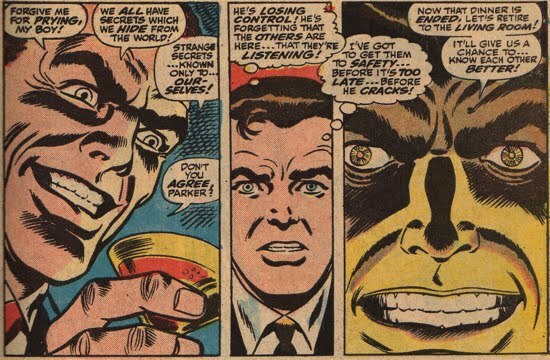 This example from Amazing Spider-Man #96 is a much less maniacal use of the phrase compared to the previous example. So the use of the phrase is not limited to taunting. After Norman's return from the 'dead', he continued to use the phrase but he shortened it to the now infamous m'boy. 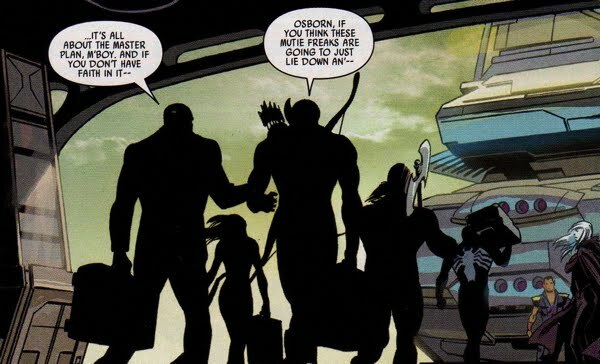 This panel is from Spectacular Spider-Man #254. 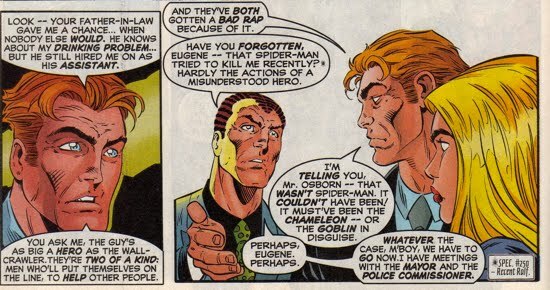 Even Flash Thompson was issued a m'boy by good Ol' Norman, so its use was not limited to strictly Peter Parker. 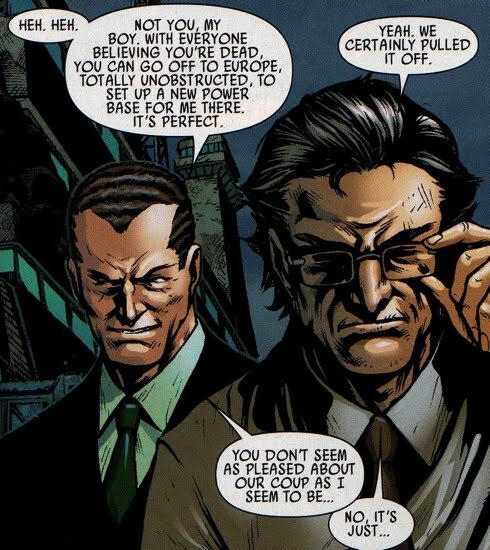 Panel selected from Spectacular Spider-Man #255. 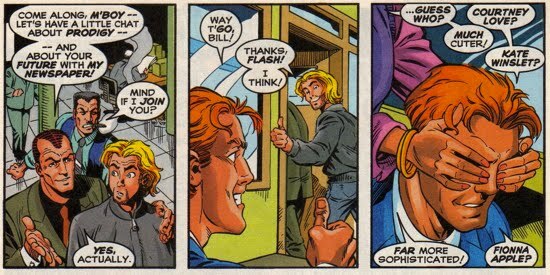 Once Flash was taken under Norman's wing, the m'boy's were a plenty as seen in Spectacular Spider-Man #256. 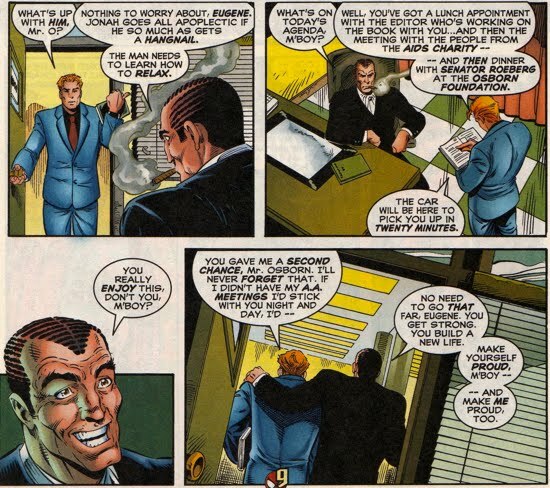 Here even the relatively insignificant Billy Walters received a m'boy in Spectacular Spider-Man #257...guess Norman just loved that phrase. 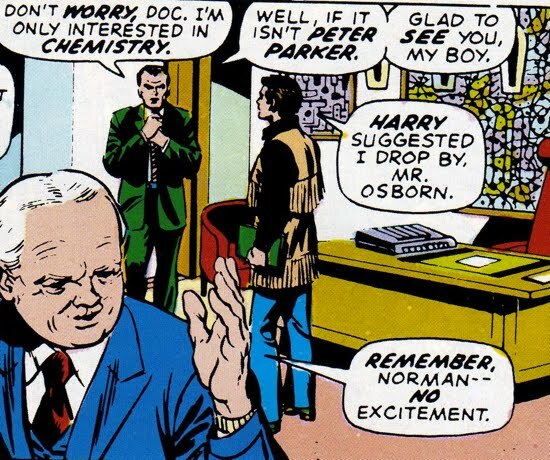 And one of the last times Norman tossed around the m'boy's occurred while he was insane-in-the-membrane during the Gathering of Five story arc. 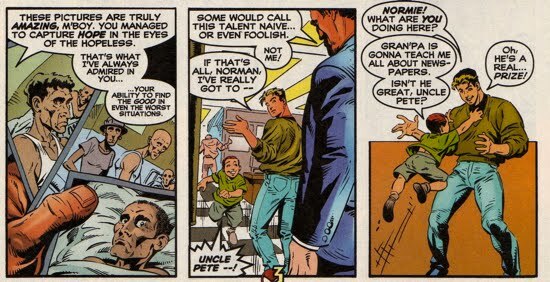 He issues back-to-back m'boy's at Peter in Spectacular Spider-Man #263. I know this seems like one of the most ridiculous articles I've posted at this site, but trust me, I'm going somewhere with this. The majority of the m'boy's that Norman issued after his return from exile in Europe came from the creative team of J.M. Dematteis (writer) and Luke Ross (artist) in Spectacular Spider-Man during the late nineties. For completeness sake, Norman tossed out a 'my boy' to the Grim Reaper (aka Eric Williams) in Dark Reign: Lethal Legion #3 (story summarized here). *special thanks to Jorge Alberto for finding this one for the Goblin's Hideout!